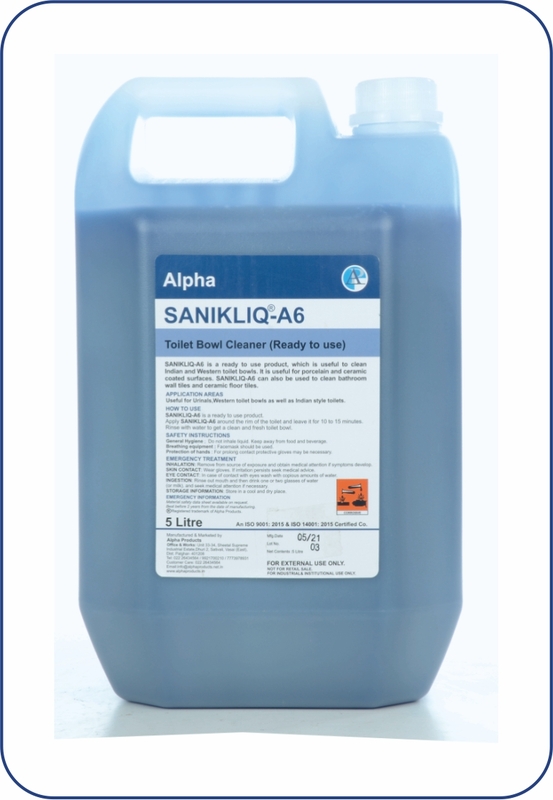 SANIQUIK-A6 is a ready to use liquid, which is useful to clean Indian and Western toilet bowls. It is useful for porcelain and ceramic coated surfaces. SANIQUIK-A6 can be used to clean bathroom wall tiles and ceramic floor tiles. Useful for western toilet bowls as well as Indian style toilets. SANIQUIK-A6 is a ready to use product. Apply SANIQUIK-A6 around the rim of the toilet and leave it for 10 to 15 minutes. Rinse with water to get a clean and fresh toilet bowl. Don't use on steel and food contact surfaces.